We use premium high quality vinyl for the manufacture of our units. While this is more expensive than the cheap vinyl available from China, it is much more durable and has a longer life. 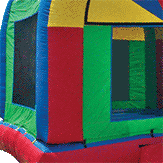 Many of our original bounce houses manufactured over 10 years ago are still in use, and look good. 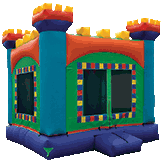 During the manufacture of our typical outdoor entertainment units, we use 18-ounce and 16-ounce for the floor and base of the inflatable structure and 12-ounce material is used for everything above the base. By doing this we maintain structural integrity while making the unit lighter and easier to maneuver. For specialized needs, we will work with you to use the designs, materials and approaches that meet your specifications. Two different materials are typically used for baffling, depending on the purpose and location of the baffles. The base of the unit requires textilene transport mesh, while the material used in the upper structures is a 200-denier coated fabric. The textilene mesh is also used for windows and ceilings. We use #277 bonded lubricated polyester thread. The material used for our zippers is ziplon chain, 10CF Black �� 100m. The columns on each unit are larger than our competitors� units and are designed to stand up to what kids dish out. Our specially-constructed hinge seams allow extra flexibility between the main frame of the house and the base. This extends the life of the unit and reduces the likelihood that repeated repairs will be necessary. The baffles in the base of each of our units are made from heavy duty solar mesh. 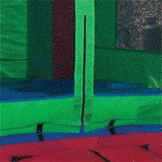 We design the baffling in our larger units (obstacle courses, wet/dry slides, etc.) to efficiently direct airflow and maintain rigidity in the outer walls. We incorporate safety measures wherever possible in our designs. Just one example: our units are constructed using �snakes� or �Ts� (see photo) wherever the flooring meets at a seam. These are double sewn to the flooring and the baffles so that if one seam were to break loose the other seam would hold, thus preventing anyone getting hurt by slipping through the floor and between the baffles. Our windows are made from solar mesh that blocks harmful UV rays from the sun while allowing for maximum airflow. 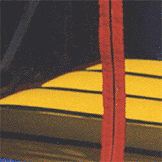 This material also eliminates the safety-threat that old-fashioned netting poses to little fingers. 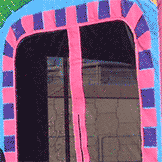 As another safety feature, we use double pull zippers so that kids can easily zip themselves in or out of the unit. At your request, the seams can be double sewn to extend the life of heavy-duty, high use units such as yours. We focus reinforcements in the areas that take the most abuse. 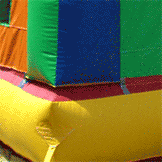 We look at the units through a kid�s eyes, imagining how we could best tear things up � having fun doing so, of course! � and then we reinforce there. As you can see from the above information, we manufacture, repair or �retrofit� units using innovative techniques and top-quality materials. We are also one of the only companies who will repair baffles or anything that has to do with baffling in our or other manufactured units. Our staff is highly-knowledgeable and experienced. We know how to put units that last together from �the ground up.� This means that whether we�re building new units or fixing existing models, you can count on a product of the highest quality and innovative service that�s second to none.